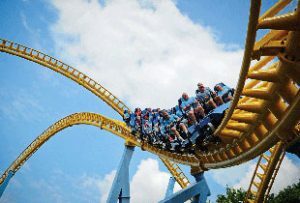 Hersheypark is an amusement park located in Hershey, Pennsylvania, near the Hershey Chocolate Factory. Hersheypark initially opened as a leisure park for the employees of the Hershey Chocolate Company, an American confectionery company. Later, the company decided to open the park to the public. Today, the park's area covers over 110 acres that features over 60 rides and attractions. Hersheypark admission also includes entry into ZOOAMERICA, an adjacent zoo. Also adjacent is Hershey's Chocolate World, a visitors' center that is open to the public that contains shops, restaurants, and a chocolate-themed ride. Both Chocolate World and ZOOAMERICA are accessible from outside the park boundaries, with Chocolate World offering free admission. Entitles the Pass Holder to All Season Pass perks and privileges for visits January 1 – June 30, 2019. Other Specials & Coupons To view Hersheypark Admission Tickets, other Specials and Coupons, go to their special page by clicking here. Hersheypark updates this page throughout the year, so check back to see if new specials and coupons have come in. Note to our visitors Hersheypark coupons and specials can change without notice. So please visit their official website to make sure of the latest pricing and coupons.